We’re all in this together. So, back to the weddings. This is a way on helping each other partner with people you wouldn’t imagine you could partner with. I’m going to suggest this for a photographer that does wedding photographs, okay? So you go to the wedding. You are one of many, many suppliers. There’s going to probably be a venue. There’s probably going to be a cake supplier who made the wedding cake. There’s probably going to be a band or a DJ. There may even be a videographer or perhaps you’re going to do that. And there’s likely to be a bar. All those suppliers are there together — all working together to support their businesses. So your job as photographer is quite obviously to take wonderful pictures of the day and to capture memories for the bride and bridegroom so they can remember forever. So as a photographer, what you need to do is in amongst taking your list of the photographs you have to take, try to capture the other suppliers at work. Don’t just ignore them, don’t just step around. Capture them doing their thing. Put a bit of effort in to getting that picture and get the picture from the point of view that shows the supplier in a good light. Now this is going to work well for the wedding but it’s also going to work for that supplier. For example, how about that cake? You’re going to have lots of pictures of that cake but why don’t you, instead of having it just with the bride and groom, why don’t you catch a couple of artsy ones of where the wedding cake supplier is setting the thing up or perhaps doing a couple of finishing touches? And same with the band or same with the DJ. Capture them setting up, capture them having fun, catch it from their side, looking in to the audience, everyone looking at them. Then, following the wedding, when you’ve done all your edits to your photographs, develop those pictures in a good size print in quality format, and give it to them. Don’t forget to put your name on it down in the corner. If there is a wedding cake supplier there, take pictures of his work, and create a little collage of his or her cakes. You know that works well. Now put that together stylishly like with the effort you put into your own album. Be sure to include your contact info — maybe your contact detail, maybe your website, maybe your Twitter handle, whatever you’re going to use most, and then, frame it. Go and visit that business owner and say, “Remember that wedding we were at? I’ve got a little gift for you, then present them with that picture. You could even offer to put it up on the wall because you know, the number of people who don’t put pictures up in the wall? You can put it up in their store, in their place of business. They get to use your expertise for their benefit, you get a friend for life, you also get an advert in their place of business where people who come for weddings, yes, sit down with the cake person. You’re following me now? And while the cake person’s there, you say, “By the way, have you seen my friend, the photographer? This is what.” Yes, now you’re with me. How about that? Was that going to cost you? Hm? Photographers, think about it. All those others you get to partner with. 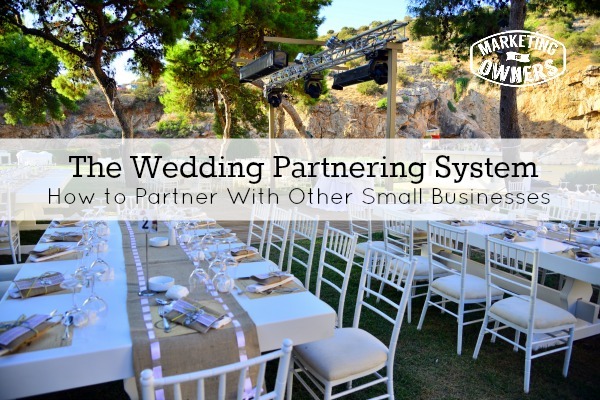 In all aspects of business, any type of business, think of partnering opportunities, there are many. 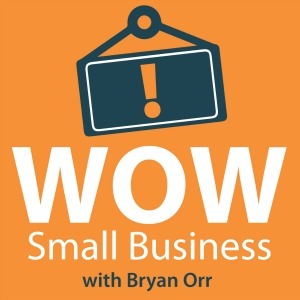 Today, I am going to recommend a gentleman from Florida called Bryan Orr, and his show is called the WOW Small Business Marketing Show. But Bryan is very, very nice. You can just tell he’s great. He’s got eight kids, he thinks they are wonderful. He says his daughter is a Jedi princess, which also I think is kind of cute. But Bryan is a good talker, he has good information, he obviously knows what he’s talking about. You will learn from him. Go and listen to the WOW Small Business marketing show. Look it up on iTunes while you’re there. Pop in a rating for Marketing for Owners show.